Lagos State Governor Akinwunmi Ambode (middle); Commissioner for Works and Infrastructure, Engr. Ade Akinsanya (2nd right); Managing Director, Sana Group, Mr. Alaa Alghadban (right); Oloja of Epe, Oba Kamorudeen Animashaun (2nd left) and Olu of Epe, Oba Sefiu Olatunji Adewale (left) during the inauguration of the Alaro Satellite City, Lekki-Epe, Lagos, on Tuesday, January 29, 2019. Lagos State Governor, Mr Akinwunmi Ambode on Tuesday launched a 1000-hectare modern satellite city in Epe-Ibeju Lekki axis projected to create over 200,000 jobs and housing schemes for all the major projects coming on board within the Lekki Free Trade Zone. 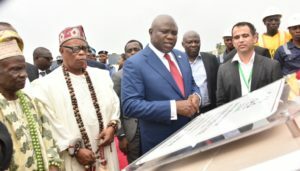 Named Alaro Satellite City, Governor Ambode described the unveiling of the project as a major milestone in his administration’s vision of making every part of the State economically viable and livable, adding that the development was a dream come true. He said with major projects in the works in the Lekki-Epe corridor such as the Free Trade Zone, largest Deep Sea Port in Africa and International Airport, among others, a new city to provide housing schemes and other facilities for workers, investors and the people generally was desirous, hence the need for the initiative. Giving details, Governor Ambode said: “The Alaro Satellite City was conceived to provide housing schemes to a broad spectrum of income earners, industrial workspaces, warehouses, hospitality and commercial office facilities amongst others. The Governor, who assured the partners of the State Government’s unshaken commitment to the success of the project, also expressed strong optimism that the initiative would be continued by successive administration being that it is about creating jobs and scaling up the GDP of Lagos. He said in anticipation of increase in human and vehicular movement within the axis as a result of ongoing gigantic projects, the State Government would construct a road to link Shagamu-Benin Expressway from Lekki Deep Sea Port and a 50-hectare truck park. According to him, “We are aware that the increase in construction and industrial activities are already taking its toll on the road networks and other complementary infrastructure along this corridor. “In order to forestall future chaotic traffic log-jams within this corridor and avoid similar incidences such as is being experienced in the Apapa axis, we have initiated the process of constructing the 7th Axial Road from the Lekki Deep Sea Port, en route the Lekki Free Zone to the Shagamu-Benin Expressway. Besides, Governor Ambode lauded the host communities for their trust and forbearance, revealing that the State Government had approved 750 hectares of land as resettlement land for communities displaced from Parcel B of the Lekki Free Zone namely Yegunda, Abomiti and Eyin-Osa. He said the Lands Bureau had also been instructed to expedite action on the enumeration of the land in question to accelerate payment of compensation and the issuance of the C of O, just as he assured all stakeholders of the commitment of government towards ensuring the security of all investments and maintaining good harmonious relationships between the investors and the host communities. Speaking earlier, Minister of Agriculture, Chief Audu Ogbeh commended those behind the project particularly Governor Ambode, saying his politics were about development and economic prosperity. “I am particularly happy to be here for the launch of this project. Lagos is Nigeria’s New York and I am told that nearly 72 percent of Nigeria’s currencies circulate in Lagos and I am even happier because I like the politics of Governor Ambode because though you are a much younger person than I am, I can assure you that you have a big future ahead. “The biggest responsibility of a governor in any country and in Nigeria in particular where we are struggling to build an economy is to develop the economy of the State; every other thing comes after. We have to create jobs; there are too many of our young people graduating from school looking for jobs and so when you find that an investor and a governor are investing and creating those jobs you desperately need, you definitely would put your hands together for them,” Ogbeh said. CALL 767 FOR LAND USE CHARGE ISSUES!!! The newly commissioned Biosecurity Laboratory at the Mainland Hospital, Yaba, Lagos, on Tuesday, October 30, 2018.